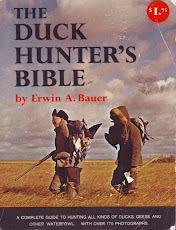 Review given by avid hunter without payment, read below. After too many years of using backpacks and gunnysacks, really I’ve used everything under the sun, I went back to a wooden box for stowing and transporting my hunting gear. I’ve purchased at least four “boxes” in the last half dozen years and found myself repairing each one, to some degree, every “off-season”. Frankly, the tomato crate with a slide-on top and cut out handles required less maintenance than those from “big name” sporting shops but much too heavy and bulky. This off-season I vowed to find a better “Mouse Trap” rather than repair another one. 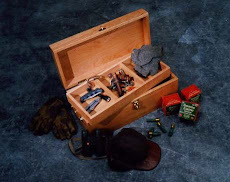 After reading Ms. Terry’s blog recounting the origin of the Gunning Box in which she addressed all of my issues and complaints with my previous boxes I thought I may have found the holy grail of hunting gear organization and transportation. And I did, The Quail Flats Gunning Box. First, after you get over its understated beauty, pick it up and open it, you can really feel the attention to detail and how well it’s constructed. The dovetails are perfectly matched with no ridges or open seams. The finish has been expertly sanded and sealed to create a deep and rich look without the high gloss sheen. The divided lift-out tray is solid, and lightweight thanks to its cherry dowels. Second, both the hardware and wood selections are of the very best quality. The handles, hasp and hinges are appropriately sized for strength and are visually appealing. Careful wood selection (Cherry in my case) avoided blemished materials without the look of my dining room table, a very nice balance indeed. Finally, the “little” details that are clearly the product of field-use experience. Like the “knuckle saving” built in handle stops, perpendicular to the box.. Hinges that by support the top (lid) just past 90 degrees in an upright position, which prevent the top’s weight from tearing the hinges out. The Quail Flats Gunning Box’s size allows for plenty of gear without being awkward to carry. Don’t think it’s useful only for shot gunning. 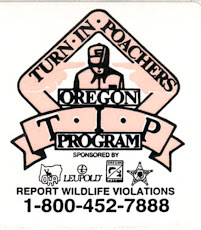 On my second day I swapped out the ammo and cleaning kit, leaving general hunting supplies, then added my spotting scope, compact tri-pod and headed for the range with my deer rifle. I’m highly confident that the Quail Flats Gunning Box will last not only my lifetime but also my son’s (five years old) and his son or daughter’s as well. You know there’s no zealot like a convert so if you would like to discuss, Ms. Terry has my number; call me. 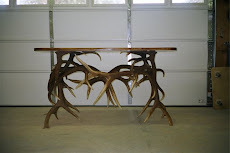 I made this table out of 4 pair of Oregon natural shed antlers. Solid Alder top. Only 4 tips of points were removed to get it level. Contact me to commission a custom piece. 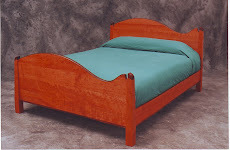 Elegant and refined, I custom designed this queen size bed frame using traditional mortise and tenon joinery. This is quartersawn Cherry and no color enhancing has been done. It is finished with 12 coats of oil, all done by hand. 85" H. x 46.5" W. x 24" D.
Made from 3/4" Birch plywood with solid Birch face frame. 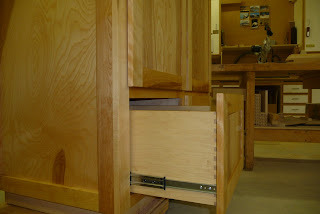 Custom dovetailed drawers made from 1/2" Maple apple plywood. This is a custom built armoir that is very simple yet elegent and under stated. 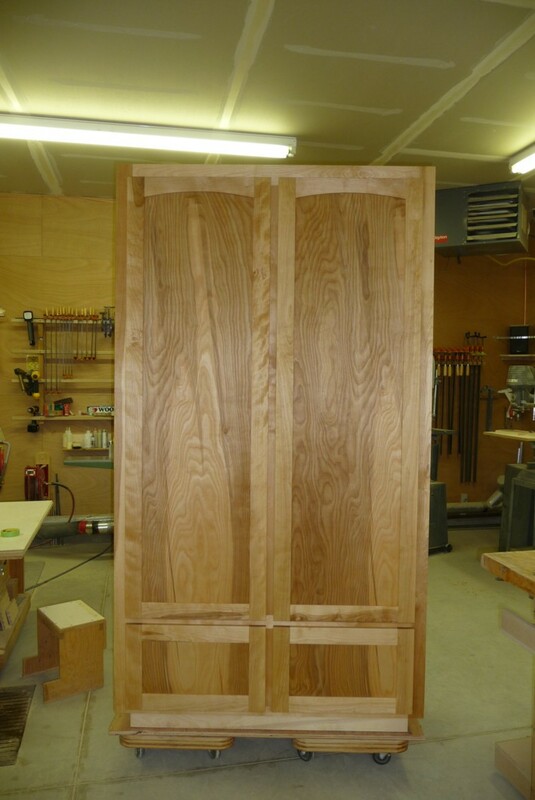 The customer chose not to have crown moulding along the top and will select hand pulls for the doors and drawers once it is on site. The finish is hand applied Watco Natural Oil.